It is a time of profound, unprecedented changes and uncertainties. The probable questions on everybody’s mind are: where should we go and what kind of a world do we want? China’s answer is: we should build a community with a shared future for mankind. This demonstrates a responsibility for the progress of the entire humanity. A single flower does not make a spring. The success of a few is not prosperity for all. The future of the world should be in the hands of not a few but all the countries, and so should global affairs be governed, because in the time of globalisation, all countries of the world are “in the same boat”. It is not good enough to only mind one’s own business. It is shortsighted, unsustainable and even counterproductive to advocate one’s supremacy over others, refuse to share benefits or even “beggar thy neighbour”. Building a community with a shared future for mankind was proposed by Chinese President Xi Jinping. It is in keeping with the trend of history and outlines a common future for mankind. It upholds multilateralism and champions fairness and justice in international affairs. This is the right road to prosperity. On this road to prosperity, world peace and common development are the fundamental goal and the ultimate direction. Amidst the complexity and confusion, uncertainties and instabilities, resulting from rising protectionism and populism that call for “putting one’s own country first”, the best way to avoid getting lost is to keep to this direction. For peace to endure, countries of the world need to adhere to dialogues and consultations, take the road of peaceful development and choose dialogue over confrontation and partnership over alliance; for prosperity to be inclusive, there should be win-win cooperation, healthy economic globalisation and open world economy so that the pie of progress is bigger and more fairly shared. If countries of the world stay in the right direction and keep up their joint and hard efforts, peace and prosperity will one day dispel the clouds of turmoil and poverty. When countries work together, they are bound to find differences between them. It is natural for all living things to be different. So it is for over 200 countries and regions in the world to differ in culture, race, religion and social system. But despite the differences, there is only one blue sky overhead and one planet earth that we call home. As we Chinese often say, “All within the four seas belong to one family”. The idea of a community with a shared future for mankind reflects this wisdom of harmony and coexistence. Building such a community, countries need to have an inclusive mind, pursue harmony without uniformity and seek common ground while shelving and bridging differences. This will enable them to treat each other equally, engage in exchanges and respect diversity so as to learn from each other, achieve common progress and build a more colorful and prosperous future. Since 2017, the proposition of a community with a shared future for mankind has been incorporated into UN resolutions and has received increasing appreciation and recognition from the international community. It is China’s vision of how countries of the world should handle their relations in this new era. As President Xi Jinping said, “Being a big country means shouldering greater responsibility for regional and world peace and development, rather than having greater monopoly over regional and international affairs.” Both China and the UK are permanent members of the UN Security Council, key partners in the G20 and important civilizations. 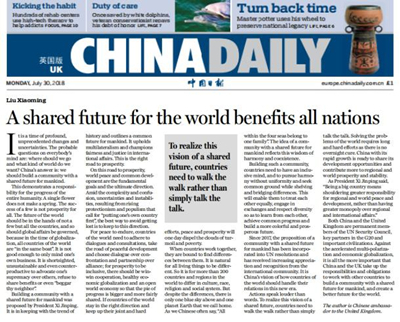 Against the accelerated multi-polarization and economic globalisation, it is all the more important that China and the UK take up the responsibilities and obligations to work with other countries to build a community with a shared future for mankind, and create a better future for the world.